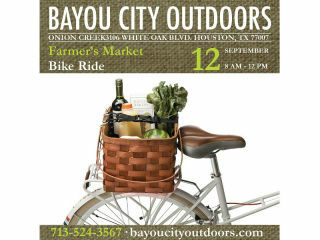 Life in H-town is constantly evolving, in a large part thanks to the local farmers markets. Did you know many of our local restaurateurs shop at the farmers markets each week for handcrafted cheeses, local produce, baked goods and locally sourced organic meats? This bike ride will use the side streets, trails and residential areas in the heart of Houston to meander around. The morning will start off with a leisurely coffee at Onion Creek and then cruise to the markets to shop for fresh produce, sauces, jams and bread. This is a 12-15 mile ride that lasts about three hours so bring plenty of water and a backpack to carry your goodies. Plan on sticking around after the ride to enjoy lunch at Onion Creek Cafe. They are a locally owned eatery, good food, good brews and good friends. No bike? No worries! You can pick up a bike from a B-Cycle kiosk around town.